Which camera would you choose, and why — the newer Nikon D300S, or the older Nikon D300? In this post, I attempt to compare and summarize the benefits of, and the differences between these two digital SLR cameras from Nikon and hopefully, this will help those who are researching whether to get the D300S or the D300. In terms of resolution, both cameras have the same 12.3 MP (Megapixels), so you’ll have to make the final decision on which camera to buy based on the other comparison factors. For a quick side-by-side comparison of both cameras, see this page on DPReview. DC.Watch has a couple of side-by-side photos of both cameras. The images are self-explanatory, but you might prefer to read Google’s English translation of the page. Front view — no significant changes. Rear view — notice that the back button on the D300S has a better design, with an OK button in the center. Left side ports — the D300S has the newer, mini-HDMI terminal. Right side memory card slots — the D300S can accommodate two cards: one CompactFlash (CF), and one SD / SDHC. Further down the article, there are low-light, night pictures taken with both cameras at all ISO values. 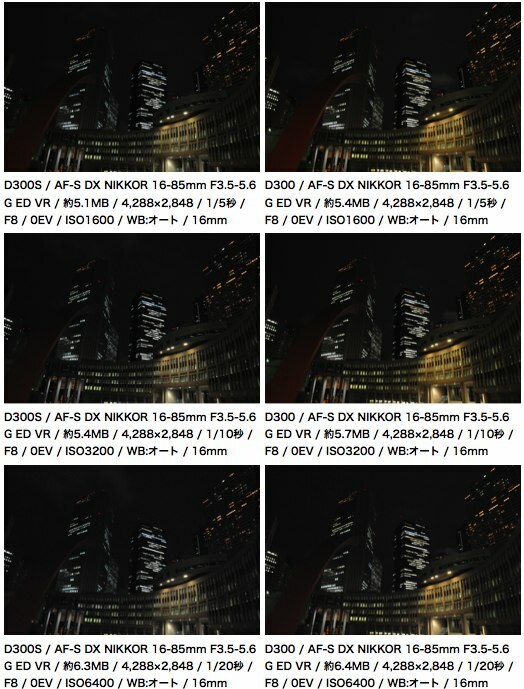 The low- and high-ISO photos show that that there is no discernible image quality differences between the D300S and D300. The Nikon 16-85mm VR lens was mounted on the cameras for these images. Two memory card slots — On the D300S, the additional SD / SDHC card slot means that you get to configure an additional storage source for backup purposes (simultaneous data writes) or for increased capacity. You could also choose to configure separate cards for RAW and JPEG files, or split still images and video / footage / movie files. The top LCD has indicators to show the status of each card (see this DC.Watch image). Faster continuous burst speed — The D300S achieves 7 fps (frames per second) without the MB-D10 battery grip (and appropriate batteries) attached. The D300 manages 6 fps. Better multi-controller button — This rear button now has a discrete OK button in the center (refer to this DC.Watch image), which makes it better for conforming settings. This central button is also used to start movie recording in Live View mode. Quiet Mode — This new drive mode on the D300S (first introduced on the Nikon D5000, see this DC.Watch image) allows you to control the mirror return phase, which occurs when you release the shutter button. Movie mode — The D300S can record HD (high-definition) video clips at 720p (1280 x 720 pixels), and audio with the built-in microphone on the front. A socket is also provided on the camera for connecting an external mic. Wider illumination coverage from the built-in flash — The pop-up flash on the D300S goes as wide as 16mm, while the one on the D300 goes only up to 18mm. “Auto” setting for Active D-Lighting — The camera can automatically decide on the appropriate strength based on the scene being photographed. On the D300, you had to manually choose from High, Normal or Low. The D300S has an additional Extra High option. Faster AF — ArmatureMike, a Nikon D300 owner, tests the D300S and reports that the D300S has much faster initial focus acquisition and tracking, even with consumer lenses such as the Nikon 18-200mm VR. … the reduced acreage of the grip on the back makes it feel just slightly less secure than the D300. You can see what the reviewers meant about the differences in the grip area on the back of the cameras in this image (the D300S is on the right). Price / Cost — From where I stand, this is the D300’s only significant advantage. 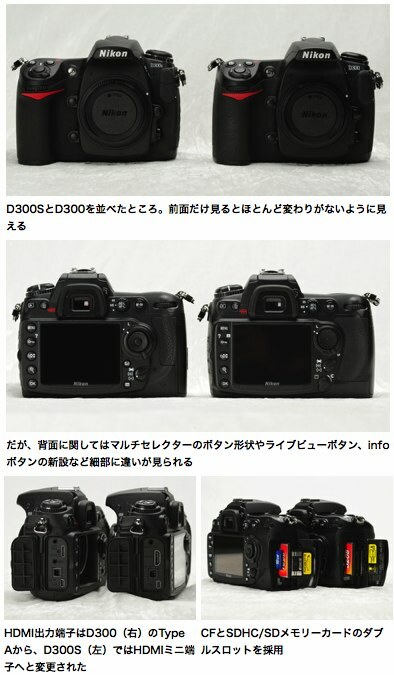 Because it’s an older camera, the price of a new D300 body is about $400 cheaper than the D300S, at the time of writing. There are also a lot more opportunities to purchase a used or refurbished unit that is in good condition. Based on the specs and features alone, the D300S is the better camera. However, if you don’t require all the bells and whistles of the new D300S, the lower-priced D300 still represents a solid investment. Movies: not likely that you want to spend money on that, but if it is you wouldn’t be asking the question, I think. Other: lots of small and often meaningful changes. Quiet shutter is actually quiet. Moving the LV off the dial to a dedicated button is useful. Accessing menus directly from the Shooting Information display is useful. Slightly better AF tracking is useful. Auto ISO has been refined slightly, and in useful ways I think for external flash users. The extra card slot is useful for those that shoot a lot (event shooters, for instance). The question really is this: are all those small other things worth the difference in price? That, I can’t answer for you, because I don’t know how you value each of them. For me, there’s enough difference that I’d prefer to pick up my D300s instead of my D300. But I’m not really bothered if I pick up the D300 accidentally instead of the D300s. Is that worth US$100? US$200? US$10? I don’t really think about it that way, so can’t answer it that way. But there are differences. Find them and evaluate them.